Breathtaking views, modern facilities and outstanding service; Adelaide’s Glenelg Golf Club is the ultimate setting for your special occasion. Winner of the 2017 & 2018 Australian Bridal Industry Academy Award for Best Club Reception Venue in Australia. Winner of the 2014, 2015, 2017 & 2018 ABIA Best Club Reception Award in SA. Winner of the 2015 & 2016 Clubs SA Award for Best Club Dining. 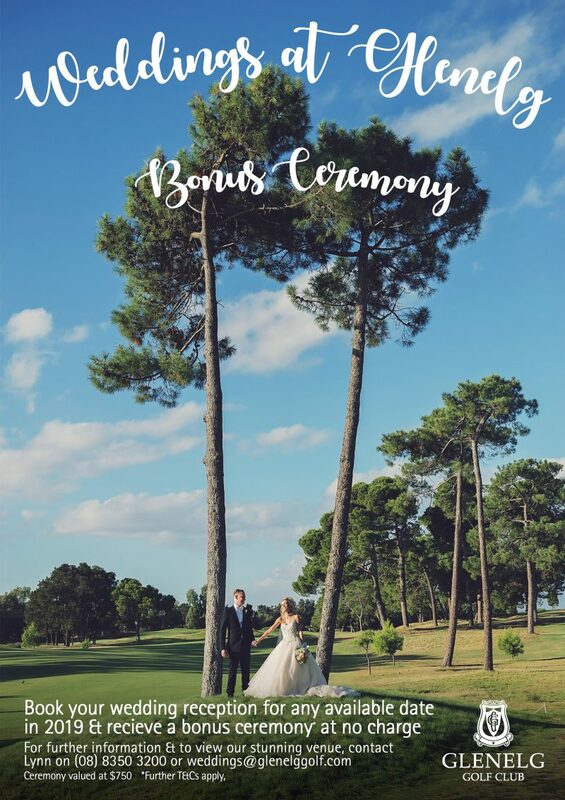 The isolated oasis that is Glenelg Golf Club hosts breathtaking views and modern facilities that make Glenelg Golf Club the ultimate setting for your wedding ceremony and/or wedding reception, all only 15 minutes from the CBD and 5 minutes from Glenelg and Adelaide Airport. Our stunning dining room exudes a wonderful balance of modern style and traditional elegance, with a sense of class and contemporary sophistication appealing to all tastes and styles, catering for up to 180 guests seated, or 300 standing. We can provide your full wedding day facility with ceremony options, amongst 100 year old pines on our world class golf course. With memorable panoramic views over the golf course, stretching to the Adelaide foothills, there is no better location for photos that will be with you a lifetime. Our friendly and professional Event Manager, Lynn, is dedicated to meeting your every requirement. We have a number of devoted award winning suppliers who are flexible and accommodating, or you are welcome to use the great range of wedding suppliers on offer. It will be our pleasure to make your special day one to remember, therefore if you have any special requirements please do not hesitate to contact the Glenelg Golf Club on (08) 8350 3200, or click here to go to our Wedding Enquiry page.